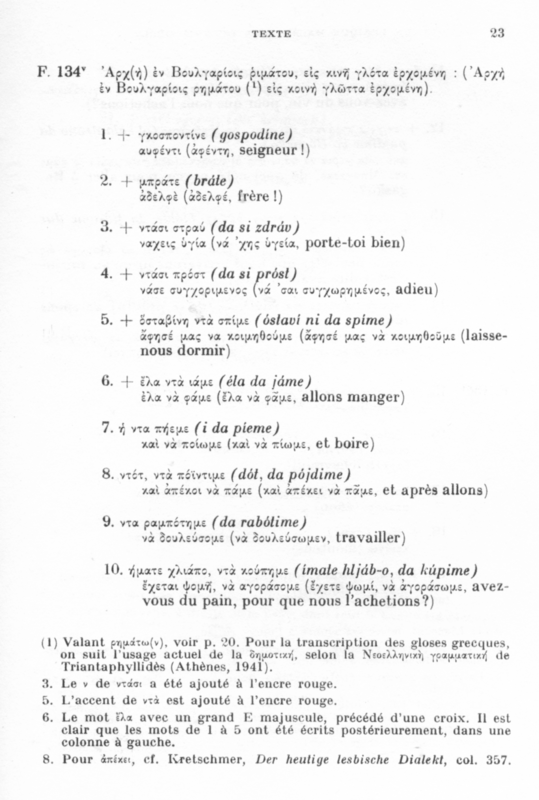 In the Textkit Greek and Latin Forum, Bedwere has been translating Sigrid Albert’s Imaginum Vocabularium Latinum into Ancient Greek over the past year (as Λεξικὸν Ἑλληνικόν). Albert’s dictionary is a Duden-style illustrated dictionary, where concepts are organised into thematic groups, and pictures of the concepts are accompanied by Latin glosses. In the (extensive) back of the dictionary, there are indexes of all Latin words used, and of their equivalents in German, French, English, Italian, and Spanish. The intriguing part of the dictionary is that the concepts are modern. (Or at least, modern-ish: the dictionary was written in the 90s, which means its stationery and technology section has dated badly: when was the last time anyone dealt with a typewriter ink ribbon?) So the Latin in the dictionary is substantially Neo-Latin. Halfway through Bedwere’s work, I got involved in the project, suggesting corrections and emendations to his translation, informed by my perspective as a Modern Greek speaker. As you can well imagine, the project had added fascination for me, not in terms of Ancient Greek, but in terms of Modern Greek. I made a point of seeking out any and all instances where Puristic Greek had already come up with its own Hellenic-based renderings, and minimising novel coinages as much as possible. Which means that, for the purposes of this work, I embraced linguistic Purism, and did a lot of researching of older sources (including some quality time spent with the Iliou Encyclopaedia, Νεώτερον Εγκυκλοπαιδικόν Λεξικόν Ηλίου, 1945–1960). And I found it a lot of fun! I was taken aback by how modern some of the concepts in the dictionary really were. There were equivalents of buttons in antiquity, for example, but the clear distinction between buttons, pins, and brooches is quite recent, and one that even 19th century vernacular dictionaries struggled with (θηλυκωτήριον: “something you insert into a plug [“female”]). The notion of nightclothes was meaningless in Ancient Greece, which is why the closest terms available are pretty much just blankets. And so on. Purism ran out of steam in Greek, and French loans, took over, by the early 20th century: certainly by the 1930s. The early Puristic rendering of zipper in the 1910s as τορμοσυνάπτης “peg-linker” for example was likely coined too late to prevail against French φερμουάρ, and it is quite forgotten now. I could find no trace of a Puristic rendering of “fashion model”, a concept which would have been popularised in Greece by the 1930s: only the French μανεκέν and the Italian μοντέλο. And indeed, even “roulette” had no rendering but the French ρουλέτα and the Italian ρολίνα as early as the 1860s. And of course, there is more purism in official usage than in colloquial usage, to this day. This becomes really obvious with automotive terminology: the local garage and the Ministry of Transport have completely different vocabularies: e.g. πεντάλι vs ποδομοχλός/ποδόπληκτρον for “pedal”. Whenever the Glorious Ancient Ancestors are discussed, there is an immediate and unsurprising recoiling from modern loanwords. For example a hairdresser’s cape is always a μπέρτα < French berthe; but the discussion for schools of an ancient sculpture depicting a hairdresser could not use anything but the ancient-looking περιώμιον. There are ebbs and flows in fashion in language, and there has been some movement back towards more archaic usage in Greek in the past decade or so, as a reaction to the “victory” of Demotic in the 70s and 80s. I have had a waiter offer me an ἀπόσταγμα for “spirits”; I don’t think that would have been possible twenty years ago. Online shopping catalogues are a boon for purism as well: the individual items on sale often use loanwords in their descriptions, but the categories of items in the sidebar (which are, after all, formal ontologies devised by boffins) tend to use Puristic terms, or at least more abstract terms. That was particularly noticeable on Skroutz.gr (“Scrooge”, i.e. “Thrifty”). This is not a great example (I couldn’t find the one that made me sit up and take note), but to give a poor example: the category is Διανομείς Καρτών “Card Distributors” (which the site feels obligated to translate in English (!) as Card Shufflers, but the individual items are ανακατευτήρας “shuffler”, σαμπό < French chabot, μοιραστής “sharer”. A somewhat unexpected source of purisms has been the description of stock photos online. The usual term for “hair roller” for example is μπικουτί < French bigoudi; but the Puristic βοστρυχωτής shows up instead in photo search engines like www.fotosearch.gr. Again, I strongly suspect the tag words for these sites are coming from formal ontologies translated by boffins, rather than colloquial live translation. Similarly, some attempts to reimport Ancient Greek terms into Puristic would be just too loose to work: καταιονάω has been used for “to shower”, but its original meaning in Hippocrates is “to foment, i.e. to bathe with warm lotions”. Liddell-Scott consciously purged itself of Mediaeval words with each successive edition, where they were obvious (attested in Christian theologians). Where they were less obvious, or more relevant to Classics (in scholiasts and mediaeval dictionaries), they were kept: user beware. That applies for example, notoriously, to στοίχημα in the modern sense of “wager”; it also applies to late-attested derivations like ἀποχαιρετίζω “to farewell”; ἀλφάδιον “carpenter’s square; modern: water level” (so called because they were A-shaped) is also clearly mediaeval; and the meaning “divorce” for διαζύγιον is no earlier than Arethas in the 9th century. There has been a little bit of work on Modern coinages in Ancient Greek done outside the context of Puristic and Modern Greek: the Akropolis World News, for example, or the Ancient Greek Wikipedia. These attempts are welcome, but not infallible: ἀσθεν-ούχ-ημα instead of ἀσθεν-όχ-ημα for “ambulance”, for instance, is incorrect. I am biased towards coinages by Greeks, but those coinages are mostly morphologically reliable. … Not always though! I put my foot in it when I introduced myself to the θαμῶνες “regulars” of Textkit: that is a modern derivation from θαμά “often”—and an obvious calque of French habitué; but it is also a derivation impossible in Ancient Greek. ἐλατήριον for “spring” is another such modern error: in Ancient Greek it is a purgative (“that which drives out”), and the modern sense “spring” has been affected by the etymologically related ἐλατός “ductile”. The Centre of Research into Technical Terms and Neologisms of the Academy of Athens (unsurprisingly) was a last bastion of Purism, and they were still suggesting Hellenic coinages for technical terms until the late 2000s. I got a lot of value out of their Athens Olympics volume of sporting terms. (As should be clear, they had a lot of coining work to do with tennis, and not much with soccer. In fact, with some tennis terminology, they just balked: there is no Hellenic neologism proposed to counter σερβίς “service” or ρακέτα “racket”.) The academy’s French- and Icelandic-style work on puristic coinages has attracted derision (see this this newspaper review of the Olympics volume), and the centre has given up on proposing Puristic alternatives in the past few years, now that they are under new management: they simply can’t keep up with the influx of terminology, and they aren’t being taken seriously as an authority for terminology, so they have now switched to descriptive rather than prescriptive work. I knew this, but others may not: The Perseus copy of LSJ has systematically mis-stressed words when it filled in the prefixes of lemmata. (The LSJ source text would give forms derived from a headword by just their suffix, e.g. λῐθολογ-έω “build with unworked stones”… -ος “one who picks out stones for building”.) Perseus often got the completions wrong (e.g. λιθόλογος, not the correct λιθολόγος), and unfortunately sometimes, like in that instance, you need to know the meaning of the word to know where the accent should go. (Other times, the accentuation they came up with is impossible.) The TLG copy of the LSJ spent a lot of time correcting these; unfortunately I’ve lost access to it, but the rest of you have not. In the GitHub repository for Λεξικὸν Ἑλληνικόν, where the dictionary source is available in TeX. As a paperback from Bedwere’s lulu.com shop. The dictionary does not include an English–Greek glossary, or the images (although the Textkit forum thread includes most of them); that work could be done by someone else, but there will be some difficulties using the dictionary without them. To get the most value of the dictionary for now, you should obtain a copy of Albert’s Latin original, and use them in parallel. I recommend the linguistically curious go through my discussion on Textkit: it’s somewhat dry in that it follows the dictionary page by page, but there are some pleasant surprises to be had in there. Akis Alkaios was one of the great Greek lyricists of the past fifty years, in a culture which valued and cultivated the great lyricist. In his biggest hits, With a Canoe and Rosa, he was darkly allusive, yet still successfully universal and moving—like his great contemporary Manos Eleftheriou. (Alkaios had to insist against the record company on “the land of the Visigoths” being mentioned in a zeimbekiko pop song.) I’ve hyperlinked the translations by “Ross”, which are remarkably good by the standards of stixoi.info, the Greek lyrics database. With his record Embargo (1982) the lyricist immediately marked out an identity apart from his politically engaged contemporaries, in that he also wrote as a citizen of the world, expressing the desire for world freedom with a theoretical Marxist grounding. And in that period, it goes on to say, he was liberally influenced by Mayakovsky, Brecht, and Wolf Biermann. As I was perusing stixoi.info to find decent translations (like those by “Ross”), I happened upon a poem by Alkaios from his protest period: it was published in his 1983 collection of poems also titled Embargo. I am culturally Greek. I am culturally Anglo. I am not both at any given instant in time. Which is why I did a double take, when I saw a poem about Gloriana, as seen through the lens of Greek left populism. Elizabeth; or, Epithalamium, 1600 AD. This link is more stable than that on stixoi.info. Language play is one of the things that gets sacrificed in translation; and language play—specifically, register play—is one of the things Alkaios excelled at. The final verse of With a Canoe is wrenching, with is comparison of the singer’s lovelorn body with “a cheap shooting range, / where foreign conscripts train, cursing”. It is all the more wrenching because the previous line speaks of Attica as a “pallid quarry”, violently juxtaposing an ancient Greek and a Turkish word (φαιό νταμάρι). That gets lost here: the sneer of the low (Italian) word for “interests”, νιτερέσα, the awkward folksiness of the syntax in the final line and its bathetic rhyme, “what it contains” (το που ‘χει μέσα). What gets lost even more irreparably is how the Elizabethan cultural references sound in Greek. Curtsies, virginals, minstrels: these are familiar in English to generations bred on Shakespeare. In Greek, ρεβεράντζες, βιργινάλι, μενεστρέλλοι are utterly exotic and alien; he might as well be writing about the marvels of the Safavid court. That, you can’t communicate in English. and minstrels playing for my sport. And I love England best of all. close as their own, each passing minute. And more than it, I love what’s in it. But there was a bit of misleading going on in a Facebook thread I waded into, that I’d like to correct. There’s a language in the language that I often refer to in English as Macedonian, as indeed just about everyone in English does, and that I sometimes refer to in English as Macedonian Slavonic. There is a discourse that objects to the name, and part of the armament of that discourse is to deny that it is a distinct language—in particular, a language distinct from the closely related language, Bulgarian. Well… no. There’s a 1600s dictionary of a language variant we now call Macedonian. The dictionary does not call it Macedonian, nor was it likely to have, and it does not take the position that the contemporary international community takes on Macedonian. That does not argue against what the language should be called; it just does not argue for it, either. I would not have waded in publicly, except that the link posted to the dictionary, and the version most readily found online, is the version on Archive.org and scribd.com. It has “helpfully” taken out the foreword and commentary, and left just the lexicon. It has added a summary in English of the foreword and commentary, and it is a very very brief summary, that does not do the edition justice. Rather more offensive to me, the archive.org copy chops out the first sentence of the dictionary. The sentence where the compiler gives a name to the language he is recording. Over the years, I have come across resources from the www.promacedonia.org site. If you go looking for a bias in the site, you might notice that there’s a bit more Bulgarian presence than you might expect from a Pro-Macedonian website. But the site puts up its sources unexpurgated, and that is to its credit. Those sources include the Giannelli–Vaillant dictionary. The concept of a “Macedonian” ethnicity, distinct from their Orthodox Balkan neighbours, is seen to be a comparatively newly emergent one. The earliest manifestations of incipient Macedonian identity emerged during the second half of the 19th century among limited circles of Slavic intellectuals, predominantly outside the region of Macedonia. […] Yet, throughout the Middle Ages and up until the early 20th century the Slavic population majority in the region of Macedonia were more commonly referred to (both by themselves and outsiders) as Bulgarians. However, in pre-nationalist times, terms such as “Bulgarian” did not possess a strict ethno-nationalistic meaning, rather, they were loose, often interchangeable terms which could simultaneously denote regional habitation, allegiance to a particular empire, religious orientation, membership in certain social groups. Again: that does not argue against us now calling the language Macedonian. It does not argue for it, either. For what it’s worth, the question of Bulgarian vs Macedonian as the name of the language does not occupy the attention of either Giannelli or Vaillant for a second. 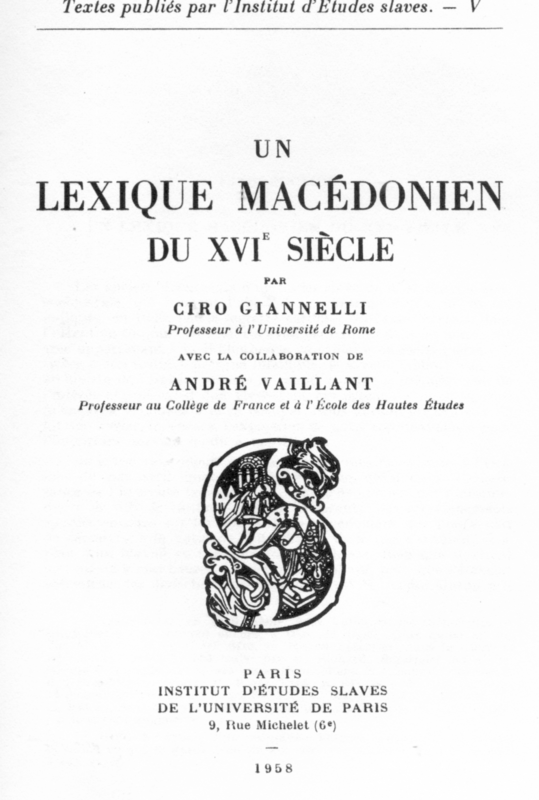 As far as they were concerned, back in 1958, it was the language of the Kastoria region (the Kostursko, as Vaillant adds); and the way for Italian and French scholars to refer to the langauge of the Kostursko in 1958 was as Macedonian. I blogged about Phanariot in the last post, but what I actually wanted to talk about was something far more tangential. Phanariot, as we discussed, was filled to the brim with Turkish loanwords. Phanariot was still Greek, and it was still written in Greek script. That included the Turkish loanwords in the Greek. But the Phanariots using Turkish words pronounced them in accurate Turkish; and they were concerned to write Turkish words in Greek script with phonetic accuracy. So they employed the conventions of Karamanlidika. The Karamanlides were a Turkish-speaking Greek Orthodox people living in Karaman and Cappadocia; being Christians, they were subject to the 1924 population exchanges, and were resettled in Greece. Whether they were originally Karaman Turks, or Turkicised Cappadocian Greeks, or, much more plausibly, both, is hard to know, and not terribly relevant here anyway. What is relevant is that script followed creed in the Ottoman world; so if a Greek Orthodox Christian spoke Turkish, and was literate, they would read Turkish not in the Arabic script, like their Muslim colinguals, but in Greek script. As an extension, Karamanlidika was the name given to Turkish written in Greek script — whether it was written by or for Karamanlides, or by the Greek-speaking Phanariots, who sprinkled their Greek so generously with Turkish. With the opening up of Greek academe to the Ottoman past, there has been much research into Karamanlidika in recent years, and Evangelia Balta of the National Hellenic Research Foundation has been the main researcher active. Her website appears to be down currently, and the most accessible resource online for Karamanlidika is a somewhat unexpected source. The Karamanlides moved to Greece. Their speaking of Turkish was frowned upon in the new country, and was not something they passed down. They did pass down other aspects of their culture, though, like their cuisine. One of those they passed their culinary heritage down to was Fanis Theodoropoulos, who has opened a Karamanli restaurant in downtown Athens: Τα Καραμανλίδικα του Φάνη, “Fanis’ Karamanli Foods”. And with the web address http://karamanlidika.gr, Fanis has felt it proper to include a blog on the restaurant website, covering not just the latest news and offerings of the restaurant, but also the culture and language of the Karamanlides and the Cappadocians. Including their script. Thus, Samples of books printed in Karamanlidika, from the 16th to the 19th century. The 16th century is a reference to Martin Crusius printing a Karamanlidika text in his 1584 Turcograecia, the first Western study of Modern Greek. Other than that, the samples are almost all 19th century, with one text from the late 18th. Now, there are several phonemes of Turkish that cause difficulty transcribed into Greek: none of <c ç h ı ş ö ü> /dʒ tʃ h ɯ ʃ ø y/ are present in Standard Greek. But as it turns out, <b d g> also pose a long-standing difficulty for transliteration in Modern Greek. Modern Greek has the phones, but not necessarily the phonemes: in many dialects of Greek, and in the Standard Modern Greek of older speakers, they occur only prenasalised, as reflexes of prenasalised stops. In other dialects, and in younger Standard Modern Greek, the prenasalisation drops off: <μπ ντ γκ> Ancient /mp nt ŋk/ > Older Standard Modern Greek /mb nd ŋɡ/ > Younger Standard Modern Greek /b d ɡ/. Which means, sure, if you want to transcribe /b d ɡ/, you’ll use <μπ ντ γκ>. But given the history of Greek, and the variation in pronunciation, you’ll also use them to transcribe /mb nd ŋɡ/. And, indeed, /mp nt ŋk/. The pronunciation of all of these has fallen together in Modern Greek, and Greek-speakers are not necessarily aware of it. Dante, for example, was transliterated as Δάντης, <ðantis>; but the Modern pronunciations of the name are /ðandis/ and /ðadis/. Greek loves using the German loanword lumpen to refer to “trash culture”, from the Marxist notion of the Lumpenproletariat, the underclass. But they’ve only ever seen it as λούμπεν, and they know less German than they do English, so they’ve pronounced it as they read it. Hence when time came for a Greek satirical website to adopt the word as its name, it inevitably ended up as https://luben.tv. What this means is that if you’re trying to transcribe /b d ɡ/ in Greek, <μπ ντ γκ> might have ended up the only choice in contemporary Greek, especially given how integral /(m)b (n)d (ŋ)ɡ/ are to the language. 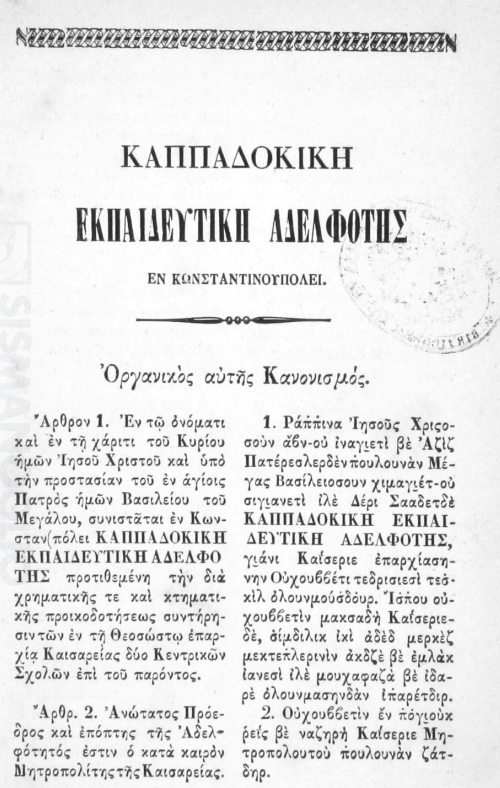 But if you are not writing Greek at all, especially back in the 18th and 19th century, you don’t have as strong a motivation to lean on the Hellenic <μπ ντ γκ>. Especially when you’re already having to deal with /dʒ tʃ h ɯ ʃ/ anyway. There is not a unified Karamanlidika transcription, but there are two main conventions one can see in the editions: one with diacritics, the other without. (The one diacritic it does admit is the diacritic 19th century Greek already admitted for Demotic: ι̮ for [j].) The transcription without diacritics fails to make some distinctions, like that between /mb/ and /b/ (both μπ), or between /ʃ/ and /s/ (both σ); it does however take advantage of the fact that Turkish has no /ð/, to transcribe /d, dʒ/ as δ, δζ. 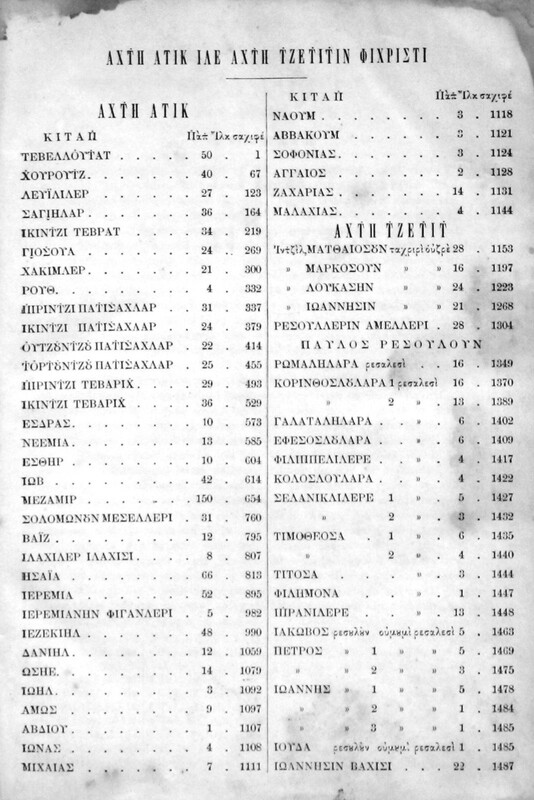 And at least by the 19th century, to judge from the samples, Karamanlidika had settled on using a spare Greek grapheme for /i/, η, to transcribe /ɯ/, in both the diacritic-based and the non-diacritic transliteration. … Except when there’s an actual Greek word in Karamanlidika. When the word is Greek and not Turkish, Greek historical orthography is respected, and eta means /i/. So in fact, to read Karamanlidika accurately, you are sort of expected to know something about Greek anyway. —contrasts the Gospel of Luke, ΛΟΥΚΑΣΗΝ Lukasın, with the Gospel of John, ΙΩΑΝΝΗΣΙΝ Ioannisin. Eta is /ɯ/ in the Turkish suffix of Lukasın; it is /i/ in the Greek name Ioannis. But I’m more interested in the diacritics used with Karamanlidika. Karamanlidika with diacritics adopted the overdot as a universal diacritic. So <χ̇ σ̇ π̇ τ̇ τ̇ζ ο̇υ ο̇> are /h ʃ b d dʒ y ø/. We have just seen δ used next to τεσ̇κὶλ: because it could not mean /ð/, it was still used to mean /d/ in some transcriptions, though not others: the Bible book list is titled ΑΧΤ̇Η ΑΤΙΚ ΙΛΕ ΑΧΤ̇Η Τ̇ΖΕΤ̇ΙΤ̇ΙΝ ΦΙΧΡΙΣΤΙ Ahdı Atik ile Ahdı Cedidin fi-Xristi “The Old Testament and the New Testament of Christ”. Similarly, while the Bible books use τ̇ζ for /dʒ/, they do not use τσ̇ for /tʃ/: Turkish has no /ts/ (hence it transliterates Tsipras as Çipras), so the Bible is content to use τζ (/ts ~ dz/ in the 19th century) for /tʃ/: Ο̇ΥΤΖȢ̇ΝΤ̇ΖȢ̇ ΠΑΤ̇ΙΣ̇ΑΧΛΑΡ <Ọutzọunṭzọu Paṭiṣaxlar> Üçüncü Padişahlar “3 Kings” (corresponding to Western 1 Kings). And there does not seem to be any use of γ̇: γγ/γκ have been accepted as /ɡ/, since Turkish has no /ŋɡ/. The Karamanlidika overdots for /b d/ have made enough of an impression on Greek scholars, that they have been reused rather far from Greek transliterations of Turkish. The plays of the Cretan Renaissance were written in Roman script, using Italian orthographic conventions; Italian of course differentiates /b mp mb/, and just as Phanariot in Greek script preserved the non-Hellenic distinctions of Turkish loanwords, so too did the Italianised Cretan of the Renaissance preserve the non-Hellenic distinctions of Italian loanwords. But those texts still ended up published in Greek script, both at the time and in modern scholarly editions. And in at least one instance (I think it’s Alfred Vincent’s 1980 edition of Fortounatos, edited from the Roman script autograph manuscript), the Karamanlidika dots are used to differentiate the original’s <mp> and <mb>. For [b] [d] [ʃ] [dʒ] some writers use the diacritics that had been developed for use in karamanlidika earlier in the eighteenth century (π̇, δ̇, σ̈́, τ̇ζ), but most make do with the unadorned Greek alphabet: thus [kurdízo] is variously represented as κουρδίζω, κουρντίζω and κουρτίζω. Peter has told me that “What this scribe (who is no doubt the author) actually writes is not three dots but more like an acute accent flanked on each side by a dot.” Other instances may have been triple dot, but this instance is more like the diaeresis + acute that he resorted to in print. Maybe, though they look like triangular triple dots to me in the manuscript anyway. Christodoulos Christodoulou informs me that this use of three dots follows Arabic practice, šīn [ʃ] being distinguished from sīn [s] in the same way in Arabic script. That diacritic is from Arabic: it is the distinction between س and ش. There is precedence for mixing diacritics and letters from different scripts; Samaritan for example has combined Samaritan letters (related to Hebrew) with Arabic vowel diacritics. This is the first time I’ve seen it in Greek. Yes, this does mean I’m coming back. Eventually.